You may have heard about the pool and spa industry’s new breakthrough sanitation technology called Advanced Oxidation Processes, or AOP, but do you know how it works or how AOP pool systems differ? To give you a better understanding of this new, fascinating innovation, we’re diving into the details of what this AOP pool and spa technology is, how different AOP systems compare and why this new technology is changing the industry. What are AOP pool and spa systems? AOP pool and spa systems use a set of chemical treatment processes designed to remove organic material from water by producing hydroxyl radicals. Hydroxyls are highly reactive and short-lived molecules, known as the “detergent” of the atmosphere, which decompose many types of pollutants. When hydroxyls are injected into pool or spa water, they quickly and effectively sanitize the water by eliminating most, if not all, unwanted contaminants. Many consider AOP pool and spa systems to be the future of pool sanitation technology because they are extremely effective at oxidizing organic and inorganic debris, combined chlorine (chloramines) and pathogens – and they do so very rapidly. This allows pool owners and operators to significantly cut their use of chlorine, bromine and other chemicals, which keeps their water looking clear, feeling fresh, smelling clean and safer to swim in. A common type of AOP pool and spa system is ozone-UV combination systems, which creates hydroxyls by combining germicidal ozone and UV light. Both ozone and UV have long been used separately in water sanitation, but when combined, they become a cohesive sanitation system that is exponentially more effective. Ozone-UV systems work by dissolving ozone gas, or O3, in water which then passes through a chamber containing a germicidal ultraviolet, or UV, lamp. This process causes a chemical reaction that results in the creation of hydroxyls which oxidize contaminants in the water and then quickly convert back into oxygen. These ozone-UV systems can be somewhat complicated due to that fact that there are two different systems involved – ozone and UV. The systems’ UV lamps require monthly cleaning and periodic replacement that can require an experienced technician to perform, which may not be a great fit for people looking to reduce time spent on system maintenance. Additionally, ozone-UV combination system installation can be somewhat complicated and can require a wetted electrical connection. The hydroxyl-based AOP pool and spa technology is different from other AOP methods because it utilizes a unique, Clear Comfort patented process to create a higher concentration of hydroxyl radicals in a simple way. Rather than treating the water directly with ozone and UV, hydroxyl-based AOP treats ambient air from the environment around the system, converting O2 into O1, and then injects the O1 into the water. The O1 molecules then react with the water to produce large amounts of hydroxyl radicals, which oxidize contaminants and quickly convert back into oxygen. Because hydroxyl-based AOP pool systems inject treated air into the pool or spa plumbing – instead of treating water as it flows through the system – the system itself can be easily mounted outside of the pool or spa plumbing configuration. In addition, the only required system maintenance for a hydroxyl-based AOP pool system is one yearly replacement of an aluminum cartridge that can easily be replaced in 5 minutes and without any prior experience. How do these systems compare? Steve Goodale, a contributing writer for Aqua Magazine and creator of one of the largest pool and spa resources called Swimming Pool Steve, wrote a review of the top AOP pool systems. The AOP review included: the DEL Solar Eclipse and Prozone ECO Master ozone-UV AOP pool systems, and Clear Comfort’s hydroxyl-based AOP pool systems. One important difference between these systems is something that is often overlooked when choosing a disinfection system – flow rate. The maximum flow rate allowed by a system makes a huge difference in the speed in which that system disinfects a pool, and the pool volume that system can properly disinfect. For example, Del AOP system can only treat up to 50 GPM, or gallons per minute, while Clear Comfort’s CCW100 system, can treat up to 90 GPM. That means that the CCW100 is able to disinfect the same amount of water almost twice as fast as the Del AOP system. Flow rate is important because in order to adequately disinfect a pool it requires multiple turnovers per day. Turnover is the amount of time the entire body of water takes to be treated. Three to four turnovers are recommended for every 24 hours, meaning each turnover must take between six and eight hours to thoroughly disinfect a pool. At a flow rate of 50 GPM with an eight-hour turnover, the Del AOP50 system can only effectively treat a pool of 24,000 gallons. In comparison, the Clear Comfort’s CCW100 with its 90 GPM can treat a 43,200-gallon pool with the same eight-hour turnover. 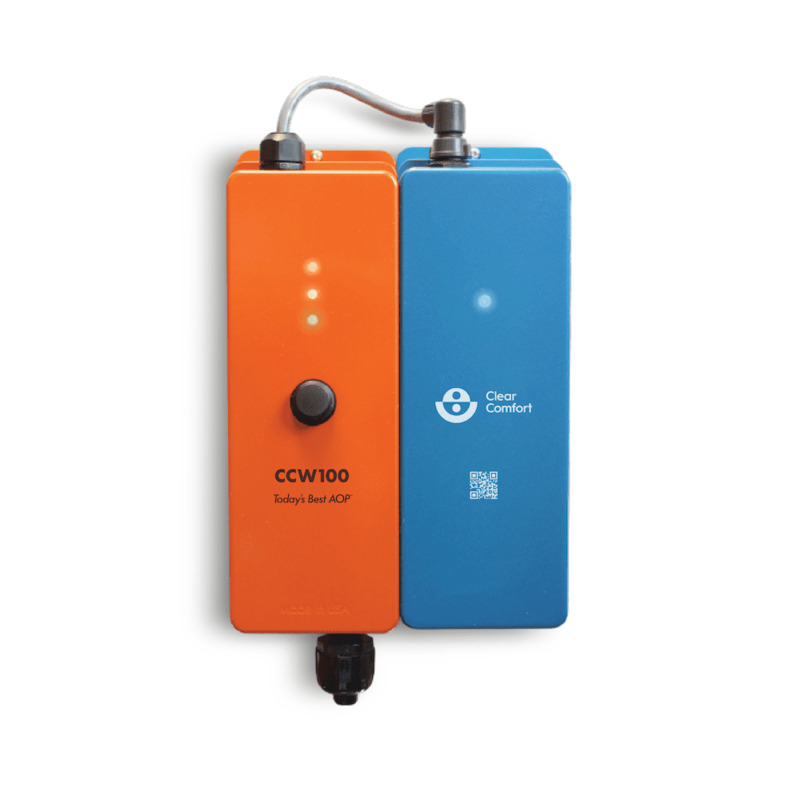 Clear Comfort’s award-winning CCW100 non-chlorine hydroxyl-based AOP pool system. With treatment capability for pools up to 15,000 gallons for one Prozone ECO Master system, this system has the lowest flow rate capability of these three AOP systems. Technology has improved the way we live, work – and now – treat pool and spa water. 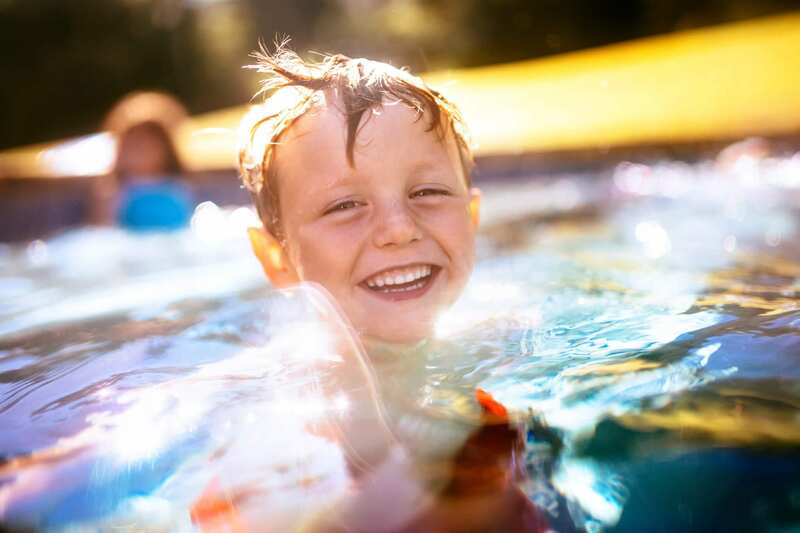 AOP sanitation technology has quickly revolutionized the industry because it allows pool and spa owners and operators to enjoy more safe, clear and soft water than ever before. However, similar to any new technological development, it was first adopted by leaders and influencers of the industry and is making its way to the mainstream. If you’re looking for the best possible option for pool or spa sanitation, it might be in your best interest to look into the new, promising technology available – AOP. Geoff brings experience in writing, publishing, manufacturing and business development to Clear Comfort. He has written freelance for publications such as O Magazine and has worked at major media outlets, such as Men’s Health and Backpacker Magazine. Before Clear Comfort, he served as a community economic development volunteer in the Peace Corps and is now proud to be a part of a leading innovative company that is revolutionizing the pool industry. Geoff is passionate about sustainability, technology and cultural exchange. He is fluent in Spanish and enjoys traveling, biking, reading and writing in his free time.